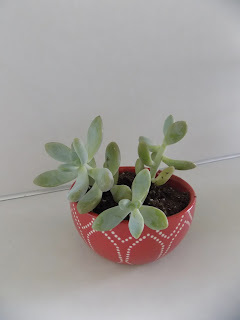 I have been in love with succulents for the longest time but have never gotten around to acquiring some. If you didn't know Erik and I just recently bought our first home and I thought it was the perfect time to get some succulents to had something to our new place. I stumbled upon this tutorial and had to do it for myself. Place pebbles in the bottom of your bowl, add your succulent or cacti, fill with your potting soil and water! I think they turned out so cute and would be a great gift. What do you think of the succulent trend?